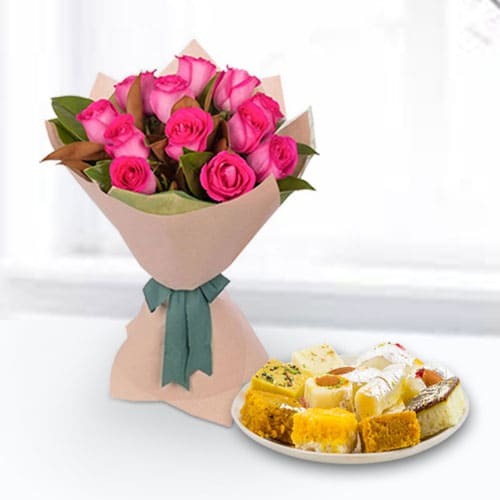 Pink Roses Bouquet and Assorted Sweets Box consisting of Burfis, Pedas, Soan Papri, Laddoos etc. 12 Pink Roses Bouquet and Assorted Sweets Box (1/2 kg (Gross Weight)) consisting of Burfis, Pedas, Soan Papri, Laddoos etc. 12 Pink Roses Bouquet and Assorted Sweets Box (1 kg (Gross Weight)) consisting of Burfis, Pedas, Soan Papri, Laddoos etc.